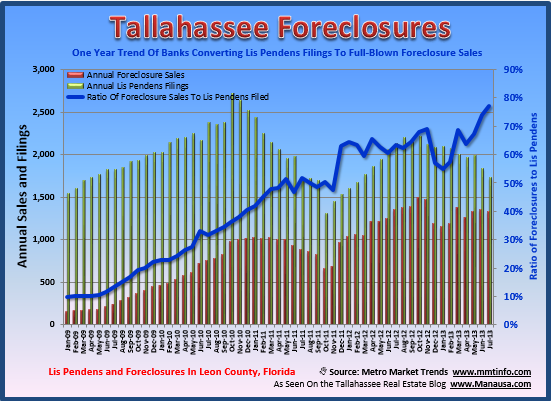 New lis pendens filings in Tallahassee fell 17% in July when compared to July 2012, and foreclosures rose 66%. The continuing decline in new lis pendens filings is exciting, as we continue to seek lower levels in order to progress in the resolution of distressed properties. The blue line in the graph below shows that 3/4 of all filings are ending up in foreclosure sale, indicating falling success with short sales due to the speed of approval of the bank.